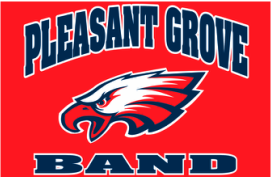 The Pleasant Grove High Band Boosters is an association organized to create interest in and give moral and financial support to the music and related programs of Pleasant Grove High School and Katherine Albiani Middle School, both located in Elk Grove, CA. At Pleasant Grove High School, these programs include Concert/Marching Band, Jazz Band, Jazz Combos, Color Guard, and Winter Percussion; at Albiani, Concert Band, Beginning Band and Jazz Band. October 8: Franklin Band Review (Saturday). The band will be competing against a number of groups from across Northern California. It is critical that “all students” are at this event. If you have a conflict on Oct. 8th, contact Mr Souliere at 916-686-0230 ext. 4776 or email at msoulier@egusd.net immediately. check out the above Band Review itinerary for detail. It's going to be warm. Bring a water bottle with ice. There is water on the trailer for refills. Jazz Band: Put your tuxedo garment bag in the car tonight if you took it home on Wednesday night! The map of the parade route is attached. The trailer parking map is attached. Note that we are in a different location this year. Row 9 going towards the Franklin football/soccer fields. Email us pictures and links to videos so that we can post them on the Band website and Facebook page. Students are in need of water and snack (candy bars, chips, crackers etc) donations for this Band Review. You may take the donations to the Band Room by Friday, October 7 or to the Franklin Band Review on Saturday, October 8. Thank you! October 12: (6-8 pm) Wednesday Band Practice before Friday Football game. Concession Sales at Sheldon High Stadium. We have an urgent need for volunteers. Please Click here﻿﻿ to sign up. Thank you! Marching Band performing @ Sheldon High School Stadium call time 6:00 pm attire. Only PGHS and KAMS marching band are performing and attire is marching band uniform. Band Spirit Wear Sales Friday Night Football 2016 at Sheldon HS. Click here sign up to volunteer. November 12: (10 - 4pm) Holiday Bazaar. Get a jump on your seasonal decorating and shopping! Visit Fall Festival & Holiday Bazaar page (next to Calendar) for detail. The Instrumental Music Program at PGHS and KAMS needs you! Consider signing up to help at the Freshman Football Game Snack Bar or the Band Spirit Wear table at home varsity football games. We also need parents and students to volunteer at our booths at the Elk Grove Giant Pumpkin Festival. Sign up via Signup Genius links below. You do not need to be a member of Signup Genius to participate.